“Always a favorite week at Tech. The sculptures look like they continue to be amazing” -Dawn F.
“One day in winter ’82-’83 I think. Not completely positive. Those details are are a little foggy. However, Jim’s food mart remained open that day, and I recall trekking over there with a sled and returning home with cases of survival essentials (of the liquid form). We didn’t have fancy video games then, so we played euchre and poker and later on when we were really glowing we sledded down Agate Street from the top. Now that was a real thrill! Thankfully we had trustworthy spotters at the bottom waving us off if a car was coming down College Ave!” -Pete J. “Back in 61–64 we closed once. The president looked out at Mt. Ripley and saw all the students over there skiing. ‘If they can make it to Mt Ripley they can make it to class! I’ll never close again.’” -David H.
“Sure did! Having Rosa Parks as the speaker at my graduation ceremony was one of many highlights of my time at MTU!” -Mary C.
“I was in my cap and gown. I think in the 4th row. I remember thinking at the time how petite she was. But yet, she had such a powerful presence.” Julie V.
“I always rode on my sorority’s dog sled. 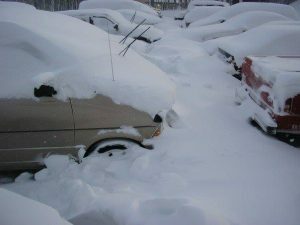 So much fun!” Tiffany M.
“White out so bad it was terrifying to try to cross 41. 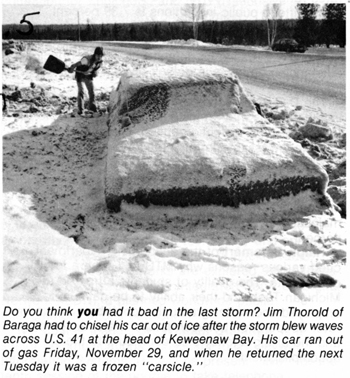 Would have probably been ‘81” -Mark C.
“ It was -35. My car was the only one that would start, so I had a car full of students from the apartments. We went to school. ’84 or ’85.” -Dan H.
“ Yes! Spring 1985, first day of spring term, I was at the Admin Building, changing some of my classes, signs everywhere that classes were canceled at noon. I went over to a friends house and NO ONE believed me! 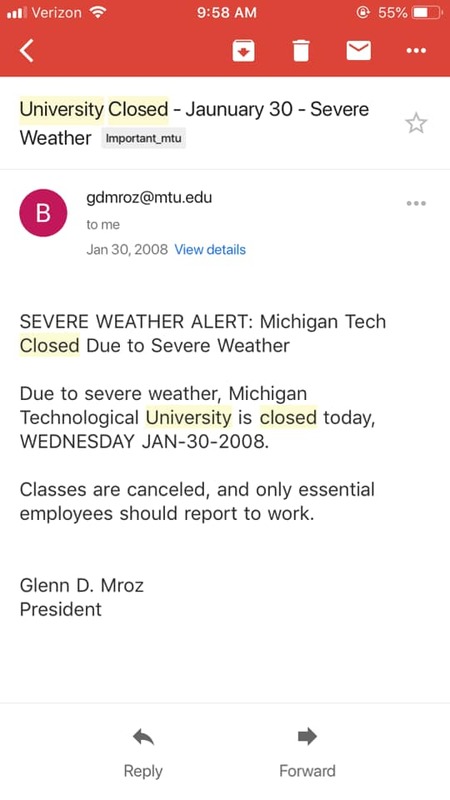 “Oh”, they said, “Tech never cancels”. 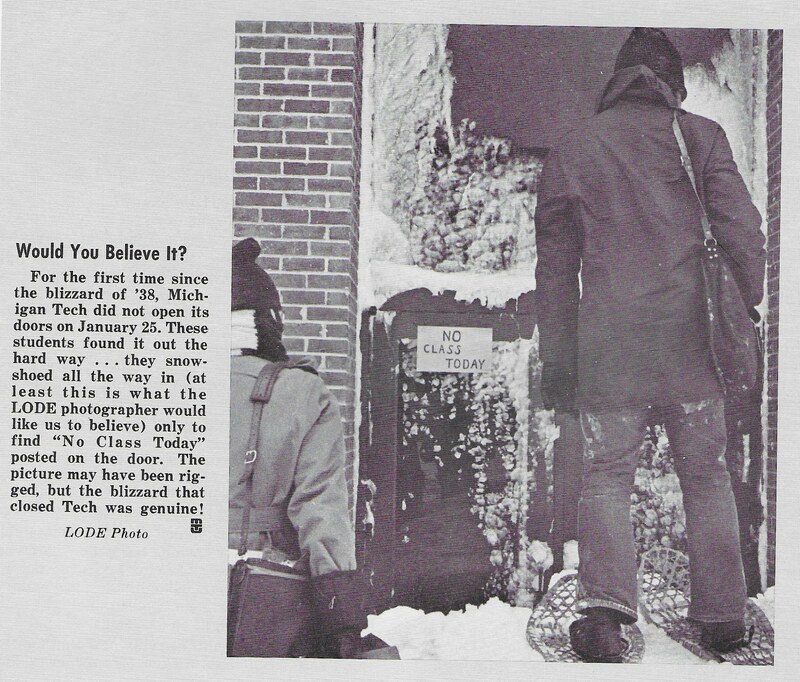 So they went to class and I stayed in and watched TV!” -Sue G.
“When I was a Tech there was a story that the school was closed once and all the students took trays and went sledding.” -John H.
Van Pelt and Opie Library in 2017. Classes are back in full swing at Michigan Tech, and that means that students are hitting the books. Huskies can be spotted deep in concentration around lab equipment, state-of-the-art computers, well-decorated whiteboards, and, of course, library tables. Drive past the Van Pelt and Opie Library late at night, or walk through the first floor reading room in the afternoon, and you’ll find students meeting with friends and powering through problem sets with help from classmates. In recognition of the importance of the library to Tech students, the building closes completely only once a year, the night of Winter Carnival’s all-night snow statue competition. Though the library and its resources have been powering Huskies for decades, the space dedicated to the library and what it provides have seen significant changes. Let’s journey back into the Michigan Tech Archives to see the life of the library over more than a century. 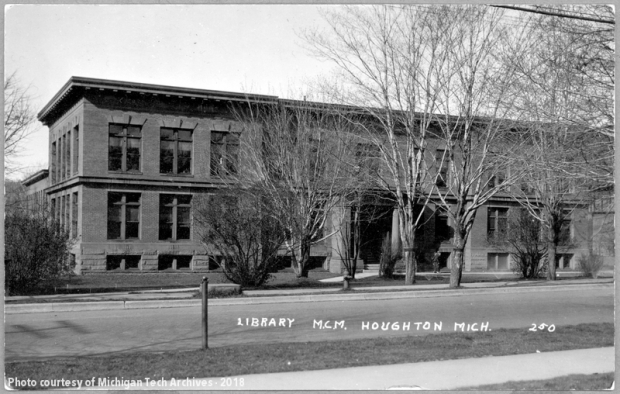 Michigan College of Mines Library circa 1920s. 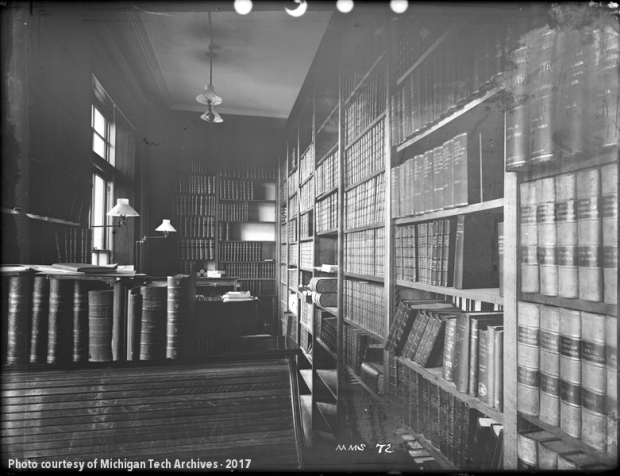 The library of the Michigan Mining School began with a gift of 3,000 bound volumes coordinated by J. Sturgis, a member of the Houghton County Historical Society; materials owned by the school’s faculty apparently supplemented these holdings. 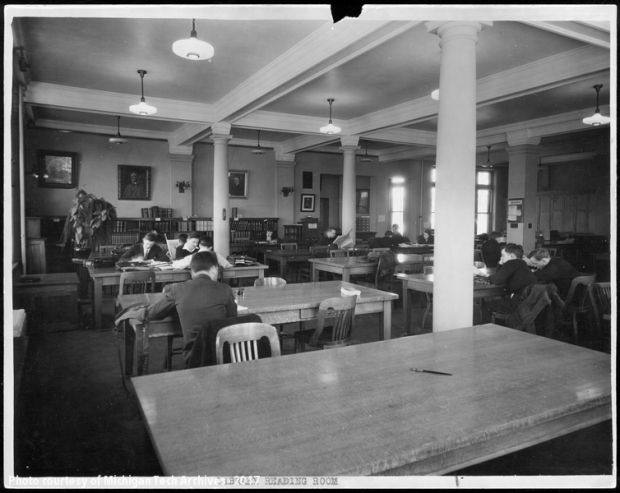 As enrollment grew and the Michigan Mining School became a college, the library blossomed. In 1912, to help students and professors alike make best use of the burgeoning collection, the Michigan College of Mines helpfully produced a “Handbook of the Library” to inform students about available materials, special features, and etiquette for this hallowed ground. By this point, the college’s books and other publications resided in a “fire-proof structure” that also housed the MCM geological and mineralogical collection. College business and executive offices shared the space, as well. As the Academic Office Building, the old library continues to host office spaces for various departments to this day. Those visiting the library were advised that the now “26,000 volumes, 14,000 pamphlets, and 1,450 maps” were “largely scientific and technical in character,” befitting the college’s curriculum. Future mining engineers could find “complete sets of all the important mining and engineering publications,” as well as “journals of scientific lines allied to mining engineering.” So patrons would be able to successfully navigate the two-winged brick building, the handbook included a useful sketch of the floorplan, showing the locations of books, newspapers, minerals, and the “modern equipment” of which library staff were proud. To clarify the availability of materials, the handbook explained that, while “the Library is intended for free reference use[,] the privilege of borrowing books for home use is accorded to all officers of instruction and to all registered students. This privilege is extended to all responsible persons who apply to the librarian for it.” Now, faculty and students are joined by all Michigan Tech staff members in enjoying the ability to check out books, and community members may also apply for courtesy cards allowing them the same opportunity. Michigan Tech library in the academic office building. A growing library with a diverse collection needed able workers to sustain it. In 1940, the Daily Mining Gazette published a profile of the Michigan College of Mining and Technology that explored its staff and the special collections in their charge. Librarian Madeleine Gibson, an alumna of Wellesley College and the University of Wisconsin who remained at Tech for 35 years, led the trio. Under her worked two library assistants, Florence McGee (who also served as a cataloger) and Lillian Combellack. 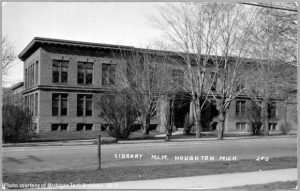 The three women oversaw holdings that had grown to 39,000 “books and bound serials, and a collection of pamphlets on scientific and engineering subjects.” Gibson, McGee, and Combellack also cared for a depository of documents produced by the federal government and the Michigan state government. The Gazette noted that a special display case had been designated as housing for the “John M. Longyear Spitzbergen collection, consisting of books, magazine articles and pamphlets on Spitzbergen.” The eponymous Longyear, a lumber baron and former member of the university’s Board of Control, had established a coal mining company on the remote Norwegian island territory of Spitzbergen (also known as Spitsbergen), and materials pertaining to the company logically found a home at the MCMT. 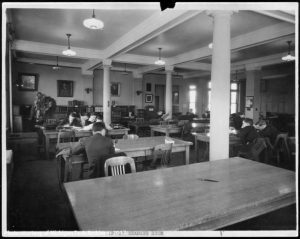 Students whose interests bent more to music than Norwegian mining could check out a set of musical books “donated by the Carnegie corporation of New York City.” Patrons could peruse the shelves during the extensive reading room hours held six days a week. 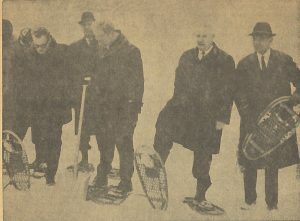 New library “snowbreaking” in 1965. 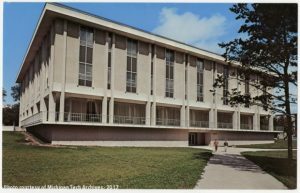 By the 1962-1963 academic year, the library building was bursting at the seams. Campus boasted over 2,700 students in more than twenty fields of study, and the library, built to accommodate a much smaller collection and student body, now housed 78,000 volumes. Governor George Romney requested $750,000 in planning funds for a new library from the state legislature, a decision that Tech president J.R. Van Pelt credited with expediting the construction by two years. Herman Gundlach, Inc., submitted the successful bid for the general contract, and work began shortly thereafter, with a “snowbreaking” held on February 11, 1965. 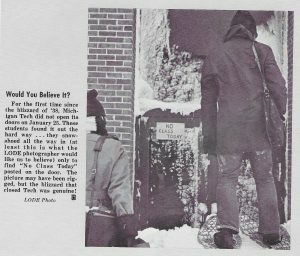 The building, situated just east of the Memorial Union Building on College Avenue, totaled 80,000 square feet over four stories, offered space for 225,000 volumes, and seated 1,000 students. According to a December 1964 press release, each of these figures represented a six-fold increase of the prior capacity. 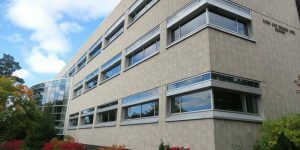 The design of the library also emphasized “flexibility provided by a modular plan of construction,” simultaneously reducing the number of interior walls, and created private study areas “around the periphery of the stacks.” Graduate students and faculty enjoyed designated study spaces, and new homes were made for the Michigan Tech Archives, microforms, and typing stations. In a move that might seem confusing to modern eyes, the design prominently incorporated a smoking room for patrons. 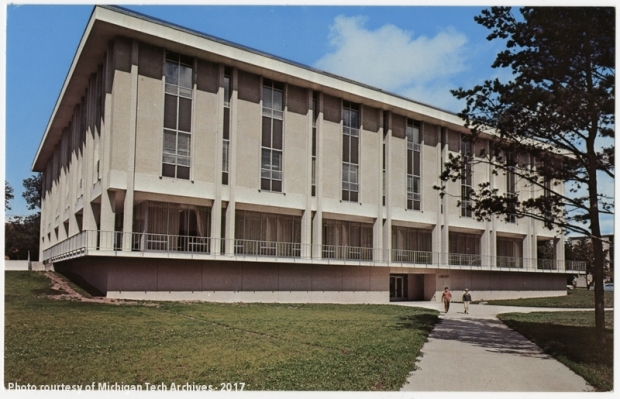 On October 29, 1966, dignitaries gathered at a large dedication ceremony for the completed new facility, which architect Ralph Calder characterized as “the most inspiring” of campus buildings “because it is the intellectual focus on campus.” The library subsequently received the name of J.R. Van Pelt, in honor of the president who led Tech during its construction. Van Pelt Library in 1999. Time marched on, and campus growth and development once again compelled changes to the library building. 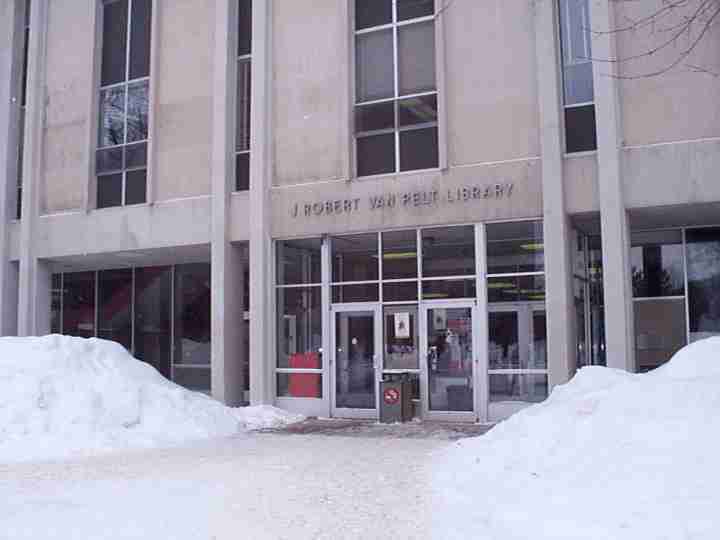 When the North Central Association made a university accreditation visit in the 1997-1998 school year, reviewers suggested that Tech “plan to increase the size and scope of library resources” and find funding for future improvements of the library physical plant. A proposal in 2000 to create a Center for Integrated Learning and Information Technology (CILIT), which would help to provide some of the improvements and connect the library to Fisher Hall, met with some resistance from staff writers at the Lode, and the building, as proposed, never came to fruition. Instead, the suggested CILIT structure became Rekhi Hall. Meanwhile, a $5 million donation from John Opie (class of 1961) and his wife Ruanne funded the most extensive renovation and expansion of the library since the mid-1960s construction. The Opie Library expansion to the Van Pelt Library, dedicated in April 2005, created a soaring new reading room with a prominent glass front, two dozen study rooms for team projects and collaboration, and “the latest technologies, including an information wall” to provide “the latest on library and campus activities, as well as a steady stream of news and weather.” In the 54,000 square feet of additional space, students also had access to a large number of public computers. 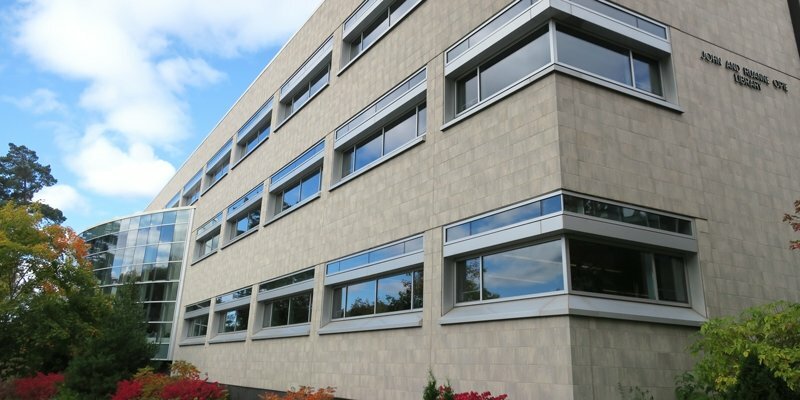 Meanwhile, visitors to the garden level would find the archives had been moved from their place on the second floor to a new, purpose-built facility that expanded reading room seating and provided secure, climate-controlled storage for irreplaceable historical records. Postcard of the Van Pelt Library. The building may be different, from its style to its location; the collection may have grown from 3,000 to several hundred thousand volumes; the smoking room may, thankfully, have given way to computer labs and cafes. 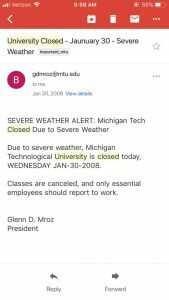 Despite the changes over the years, it’s undeniable that the library has always been and remains a cornerstone of Michigan Tech. What memories of the library stand out for you?